Value is a tricky thing when it comes to investing. How do you place a value on a stock? It is not an easy question to answer, and in all fairness it is all very subjective and there is no clear cut answer. A stocks true value is simply the price that the market is willing to pay for it. If Wall Street is excited about a stocks current and future business, the market will drive the price higher. On the other hand, if the market expects economic conditions to weaken and a company’s growth to slow, or even worse shrink, then a stock will move lower. Stocks trade relative to their earnings. Most investors judge a stocks value in terms of its price to earnings. If a company is expected to grow earnings moving forward, the market will drive up the price to a higher P/E ratio, while stocks that are experiencing stagnant or negative earnings growth will tend to trade with lower P/E ratios since the stock price will have to fall as earnings decline in order to maintain the same ratio. To find stocks that have the most value, you need to look for stocks that have low P/E ratios with strong growth prospects. This will lead to the stock’s price moving higher as earnings grow in order to maintain the same valuation as current time. If the market believes a stock’s real value is a P/E of 18, then the stock will have to move higher to maintain that valuation as the earnings move higher. Here are five stocks that appear to be undervalued and could be considered to be strong buy candidates at this time. Entertainment giant Walt Disney (DIS) has several successful business segments, with one glaring weakness… its pay-tv segment. The company’s ESPN channel has been losing subscribers, and while the sports channel was once believed to be immune to cord-cutting, subscriber numbers have been falling. The good news is that subscriber losses are slowing, and most analysts agree that losses will be small moving forward. While ESPN has been struggling, the company’s amusement parks and movie studio have been incredibly strong. Disney’ parks will always be a major tourist attraction, and its movie studio is getting a huge boost from the Star Wars and Marvel franchises and Pixar continues to pump out blockbuster animated movies. The stock has a very attractive forward P/E of 15.3, and with earnings expected to rise 12.3% per annum over the next five years the stock appears to have plenty of upside ahead of it. DIS currently trades at $116.00 with an average price target of $114.18. 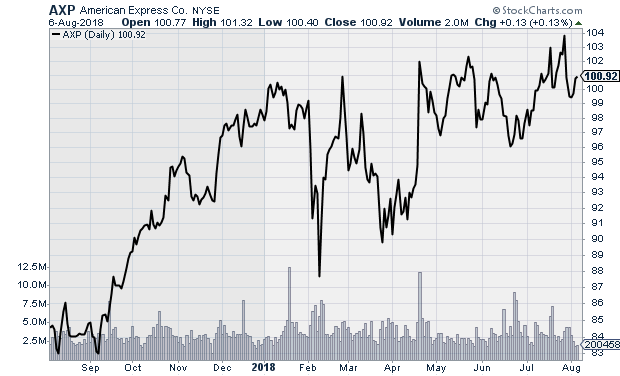 American Express (AXP) has been a solid performer the last few years, and despite trading near an all-time high, the stock remains at attractive value. AXP has a forward P/E of just 12.5, and analysts forecast per annum earnings growth of 11.8% for the next five years. Credit card operators are a beneficiary of the growing importance of online commerce, and with the overall U.S. economy running on solid ground consumer confidence and spending is good. Not only are consumers spending, they are making a lot of their purchases with credit cards, and in 2017 the average credit card balance of U.S. households hit a new record high. AXP currently trades at $100.91 with an average price target of $109.71. Rising interest rates may eventually weigh on the U.S. economy, but one sector that is poised to take advantage of higher rates is the financial sector and big banks such as Goldman Sachs (GS). Higher rates lead to increased interest income, and the fact that rates are rising is a clear indicator of the bullish view that the Federal Reserve has on the current and future state of the overall economy. GS sold off during the first half of the year, but the worst appears to be behind the stock, and the market has already started pushing the stock higher. With the weakness it experienced during the first half of the year, the stock’s valuation is down, and it currently trades with a forward P/E of just 9.3. When it take into consideration that analysts are expecting to see earnings rise by an average annual rate of 31.6% over the next five years, GS appears to be incredibly undervalued, and as long as the company is able to hit its future estimates the stock should easily make back its recent losses and possibly work its way back up to the all-time high it hit back in January. 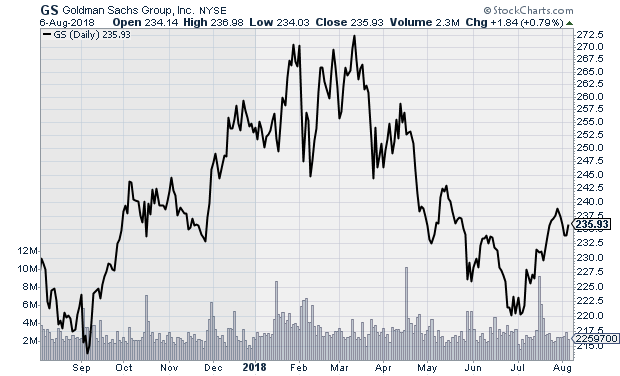 GS trades at $235.93 and analysts have an average price target of $285.91 on the stock. 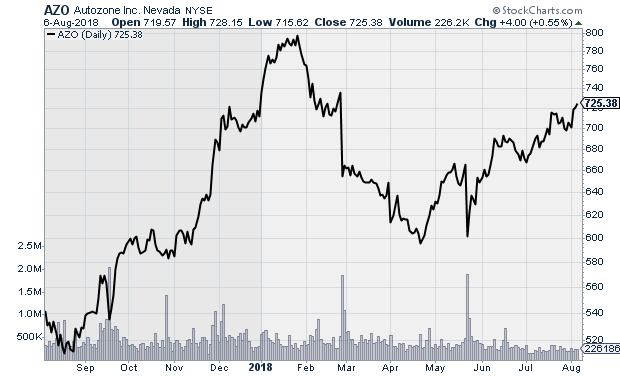 Insurance provider Aflac (AFL) is trading near its all-time high, but there still appears to be a lot of value left in the stock. The insurance sector is among the sectors best positioned to take advantage of rising interest rates, since insurance companies are able to invest the premiums they receive from customers in short-term fixed income assets prior to being needed to payout customer claims. As rates rise, all insurance companies should see a nice boost to the bottom line, and analysts expect Aflac to enjoy average annual earnings growth of 8.5% for the next five years. While we would love to see that growth number be a little higher, 8.5% is great when you consider that AFL currently trades with a very low forward P/E of just 11.2. AFL trades at $46.64 with an average price target of $47.13. 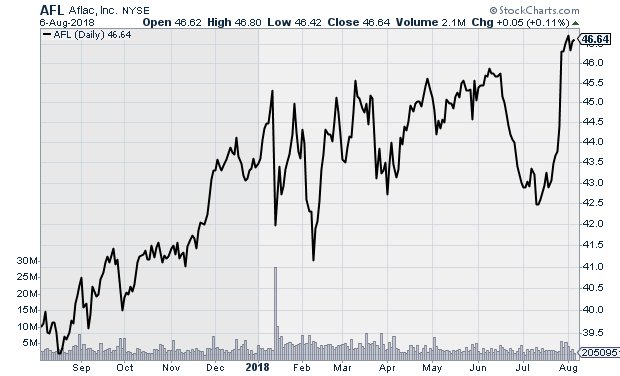 AutoZone (AZO) hit some selling pressure during the first four months of the year, but the stock began to recover in May, and shares have been in an upward trend the last few months. 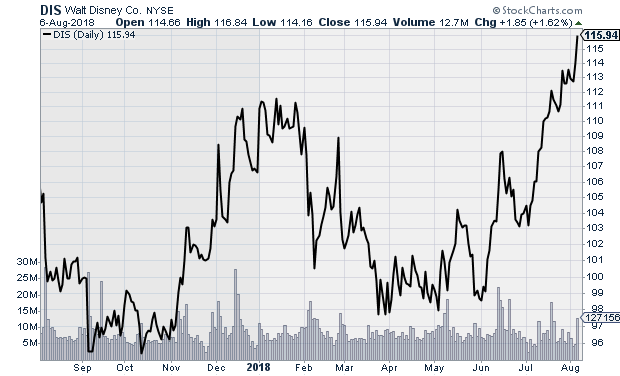 The stock’s previous weakness brought the valuation down, and AZO currently trades with a forward P/E of just 12.8. The valuation is attractive, especially when you take into consideration the fact that analysts forecast earnings will rise by 12.0% per annum over the next five years. Americans are keeping the cars on the road longer than ever before, and while that is partly a result of better built cars, older cars will always need parts and services to keep them road worthy as they age. As such, parts suppliers like AutoZone should continue to find strong demand for their goods. The stock trades at $725.38 with an average price target of $779.09.